With big, showy flowers of blue, white or pink, hydrangeas catch the eye wherever they bloom. Hydrangeas can grow in North Texas; however, they require special attention to soil preparation and care to overcome the clay soil in most of the area. Hydrangeas bloom from May through early summer. The Latin word "hydra" means "water," and these large-leaved plants need a lot of water during the summer to survive. 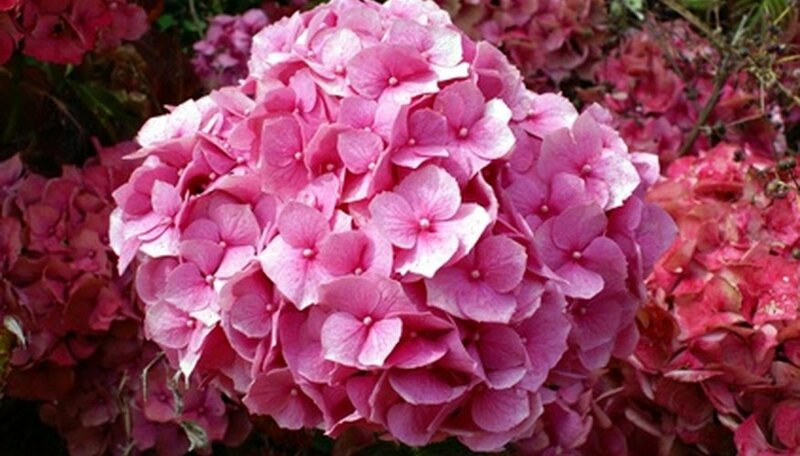 Because North Texas soils are typically alkaline, your hydrangea will bloom pink. Select a site to plant hydrangeas--preferably on the north or east side of your home. The plants like morning sun, but need protection in the summer from North Texas’ hot afternoon rays. Be sure the site is well-drained and has enough space for hydrangea plants--check the plant container’s label to find out expected mature size since some hydrangeas can grow over 10 feet tall. Remove plant materials, debris and soil down 6 to 8 inches. Break up removed soil into pieces with a small tiller. If your North Texas soil has the typical heavy clay of the Blackland Prairie, add expanded shale to loosen the soil and improve the uptake of calcium and magnesium. Refill the bed with a mixture that is half compost and half removed soil with expanded shale added. Dig a hole to the depth of the plant container. Gently remove the hydrangea from its container and place in the hole. Pat the soil around the hydrangea to remove air pockets and ensure that soil touches the root ball. Add 2 inches of mulch to the hydrangea bed and water thoroughly. Keep soil around the hydrangeas moist, but not soaking wet. Add balanced 10-10-10 fertilizer twice during the summer. Treat insect problems such as aphids with insecticidal soap and fungal infections from powdery mildew, blight, or leaf spot with a fungicide. Prune the French variety of hydrangea immediately after blooming. Prune other varieties in late fall or early spring. Add 2 inches of mulch and 2 inches of compost to the bed each fall to protect the plants from the occasional North Texas freeze.